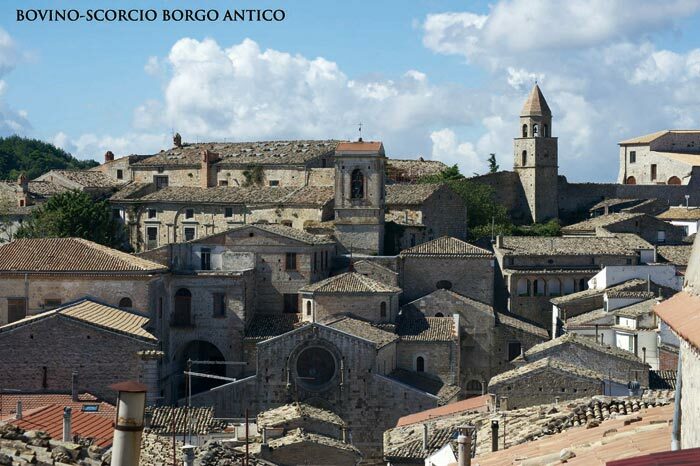 Clinging to the southern tip of the Dauno Apennines, 647 metres above sea level, stands the ancient town of Bovino in its strategic position on the Via Consolare between Napoli and Apulia. Already populated in the Neolithic period and mentioned by Polybius and Pliny as Vibinum it was a municipium and a Roman colony. The community soon embraced the Christian Faith: reliable sources date the origins of the diocese to the middle of the year 500 AD. After the fall of the Roman Empire the town was destroyed and rebuilt a number of times by various peoples: Lombards, Saracens, and Byzantines. It became an episcopal seat in the 10th century and the cathedral, a magnificent example of Romanesque architecture was built. 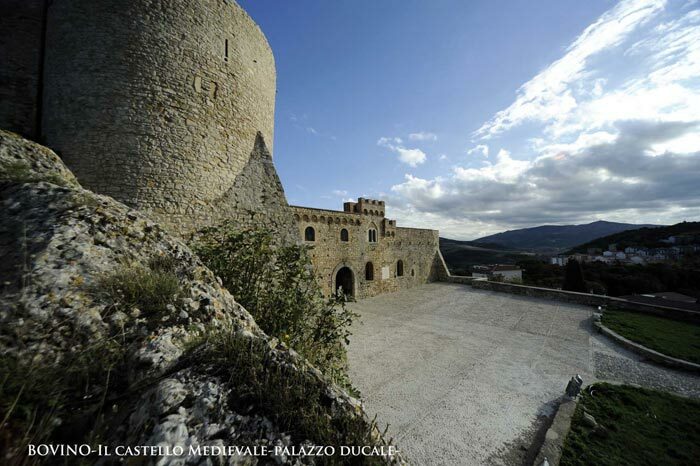 In 1045 it was conquered by Drogo the Norman, Count of Apulia, who built the castle on the ruins of a Roman fort. Later it was enlarged by Frederick II and today the imposing tower and adjacent fore tower are still visible. After being governed by various lords and feudal families, in 1575 Bovino came under the dominion of the Guevara family, lords of Navarre and very close to the Bourbons, who governed the town for over three centuries guaranteeing a period of peace and prosperity and making the castle a rich elegant home (the Palazzo Ducale of the Guevera-Suardo) and a lively cultural centre that welcomed numerous illustrious personages including Torquato Tasso, Giovan Battista Marino, Mary of Austria, and Pope Benedict XIII. The private chapel of the Dukes of Bovino is the resting place of the relics of various saints and a thorn from Christ's crown of thorns, probably bestowed on the family by Popes Gregory XIII and Innocence VIII who were related to the Guevera family. The town's museum (“Museo Civico” in the Palazzo Pisani) is home to many artefacts of Bovino's long history, as are the Diocesan library (in the Palazzo Vescovile) and in the Diocesan museum (“Museo Diocesano”) in the family wing of the Palazzo Ducale. 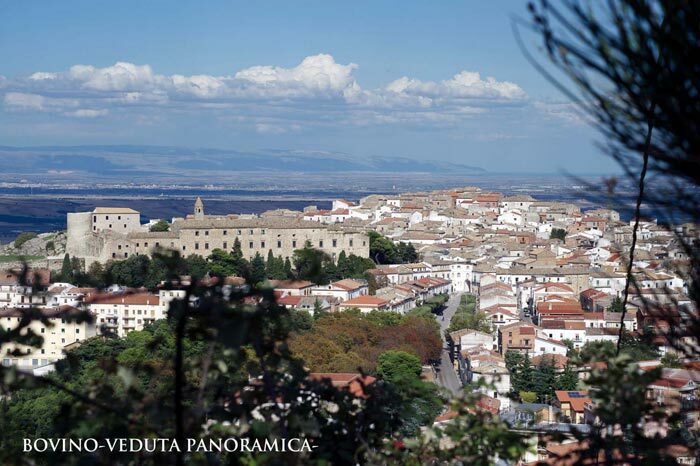 The views of the panorama and the old town centre known for its harmonious urban structure are well worth seeking out. Wandering through the streets cobbled with river stones you can see that many of the houses are adorned with coats of arm and elaborate stone doorways, about 800 of them in fact. 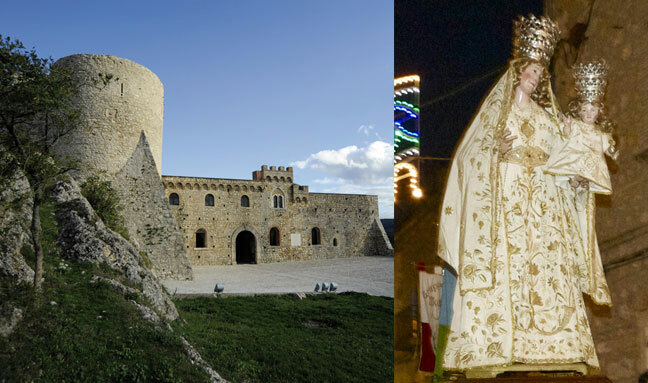 The combination of monuments, history, and beauty make the town one of the pearls of the Dauno Apennines, one that boasts the title “one of the most beautiful towns in Italy” awarded in 2003.